The Football Manager series is one that suffers a similar fate to FIFA and PES, people will buy the game and soon start moaning that nothing has changed year on year apart from a roster update. I don’t feel like that about Football Manager 2017, I feel generally quite positive about it. Two years ago I reviewed the 2015 edition of the game, and while I wasn’t immediately praising its glories, I learned to love it thanks to a long-term save. Last year though, I just couldn’t get into the game and didn’t write a review of it. Last years monsters are gone. Creating a manager this year is much easier on the eye. The problem with 2015 was that the match engine started off with some severe bugs and imbalances, and that is coming from someone who still plays matches at max speed with minimal highlights. Last year, SI Games tried to add a whole raft of new features – Create a Club and Fantasy Draft. However, being brand new ideas to the series, they were underdeveloped I came away feeling underwhelmed. This year, the match engine (which has taken some massive visual leaps forward over 2015) feels solid. I have no doubts that some players will be able to come up with near game breaking tactics, but my impressions are that the general standard of play that you witness, and the results that go with it, are to be expected. In my first few days of play, I got the impression that referees were too quick to award penalties, but after a few updates, that problem seems to have been resolved. The on-field action looks much more fluid, thanks in part to some motion capture work from SEGA sister studio, The Creative Assembly. There might be some jarring moments now and again, but it feels like SI are finally making serious strides to making the match day action worthy of the impressive behind the scenes simulation. New behind the goal camera angles don’t do any harm either, with the all-around effect making think my approach to fast paced highlights might be doing the game a disservice. One of the much hyped features is the new Social Feed. This combines football news from around the world, and a variety of automatically generated Tweets that are designed to give you an insight into how joe-public perceives your new signing or your favourite teams dire cup loss to their close rivals. It’s entirely fine…and nothing more. It’s an idea that is welcome and shows that SI aren’t resting on their laurels, but like media interaction when that was introduced, I think this will take a few years to develop into something players pay attention to for a full season, rather than simply watching for the first few weeks of a new game for the novelty factor, before glossing over it. I was tempted to base my sheep themed club on a French team in Create a Club. I chose Cardiff Met in the end. I’m certainly a fan of some other quality of life changes that have been made this year, with more options within your inbox to make decisions and take action without having to switch screens. 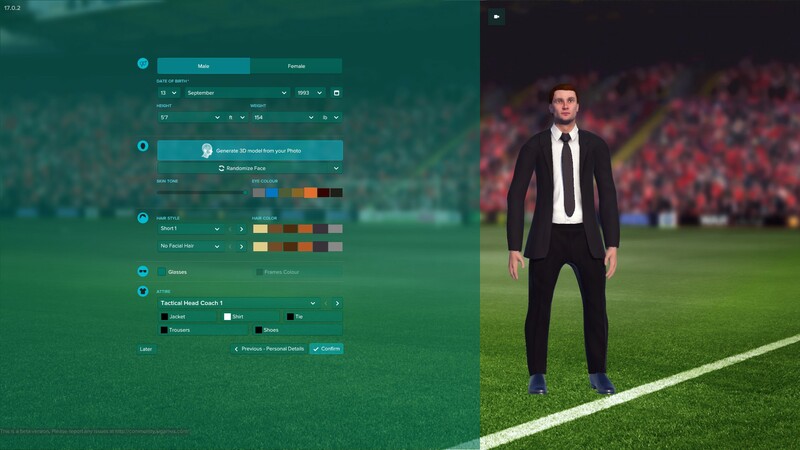 Your assistant can provide you with a pre-match tactical report, something that might not be useful to experienced players (who can easily turn it off), but can offer new players options for turning the next match in their favour. 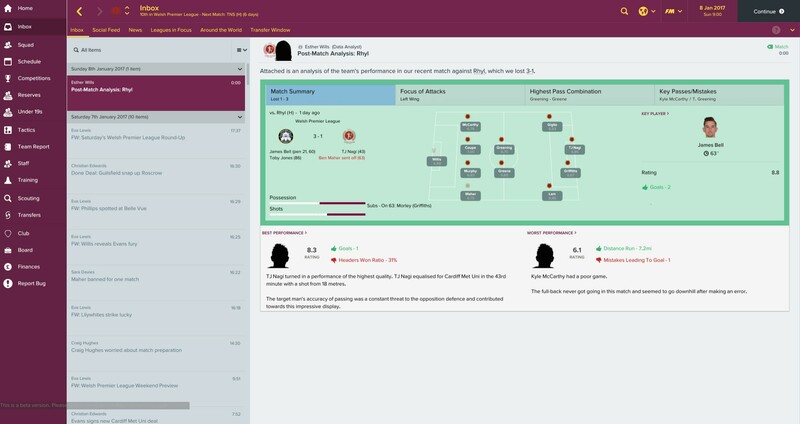 Similarly, training and recruitment advice appears in this form, allowing you to immediately apply (or ignore) your assistant’s advice on planning individual player training. It isn’t a ground breaking change, but follows the recent trend from SI to make the day to day experience of playing the game more fluid, without removing any of the complexity that players love. Another interesting feature is making promises to prospective signings. Will you guarantee your new galáctico that you will play him in his preferred position, or as a Premier League relegation contender, will you promise to allow him to use your club as stepping stone in his career? It has great potential to add some much needed depth to the transfer dealings with bigger clubs, but it falls apart somewhat with smaller clubs. I started my career with Cardiff Metropolitan University in the Welsh Premier League. Cardiff Met are a University side and are stuck with an amateur status which means they don’t pay any of their players or staff, and are all around undesirable side for a lot of people to join. So, a prospective signing asking for promises to improve the attacking depth in the squad and quality of backroom staff is a bit unrealistic. Thus is the world of Football Manager where SI are constantly trying to balance the desires of the casual players who only want to take over their hometown club or a perennial Champions League contender with those dedicated fans of Lower League Management. The social feed is a nice feature at first…but it grows tiresome and repetitive. Again, quality of life improvements seems to be a trend with this year’s edition of the game. 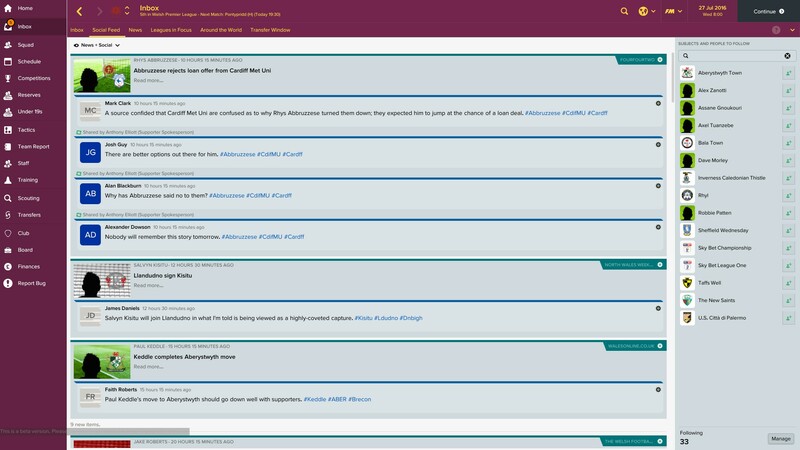 The idea of Quick Starts has been knocking around the series for well over a decade, most often appearing in the demos for the original titles like Championship Manager 3. They offered a quick way of getting into the action without the hassle of loading a full database. Over the years, as SI have moved toward pre-release betas and away from demos, the Quick Start feature has slipped away. This year it returns and creates a new game in half the time it normally takes to set one up. Choose any team you want to manage from any of the available leagues in the game, and you will quickly be in the action. Choosing to start a new game with Cardiff City saw the English, Scottish and French leagues loaded into action. Starting a Quick Start as manager of LA Galaxy in the MLS led the game to load the Mexican leagues, along with the German first division and the top four English leagues. The English leagues are based on my selection of Cardiff City as my favourite team, but I don’t know why Germany was chosen. These aren’t the league setups that I would choose for my main Career game, but they’re a quick way into the action. If you do choose a Quick Start, you can still add leagues at a later date, with the your new leagues appearing at the start of the next season. It’s an element where a now long-standing feature of adding leagues mid-game becomes extremely useful to add some variety to proceedings. It’s true then that there is nothing ground-breaking in the core Career mode, but a series like Football Manager matures as the years go by. A feature that you didn’t like in one edition might be substantially improved in the next, without the changes to the feature being publicised as headline news. One such change has been made to the Fantasy Draft mode. This was a great idea to see in last year’s game, but one that ultimately left me feeling flat with it being so heavily tailored to online play. While it is a great feature for playing with friends, and is heavily customisable in the setup to make it short and snappy, it doesn’t work for those of us whose friends tend to play FIFA on the consoles to get their football fix. A well balanced AI team in Fantasy Draft. This year, Fantasy Draft includes AI, and the AI is smart, and show how much preparation and planning you need to do to compete. 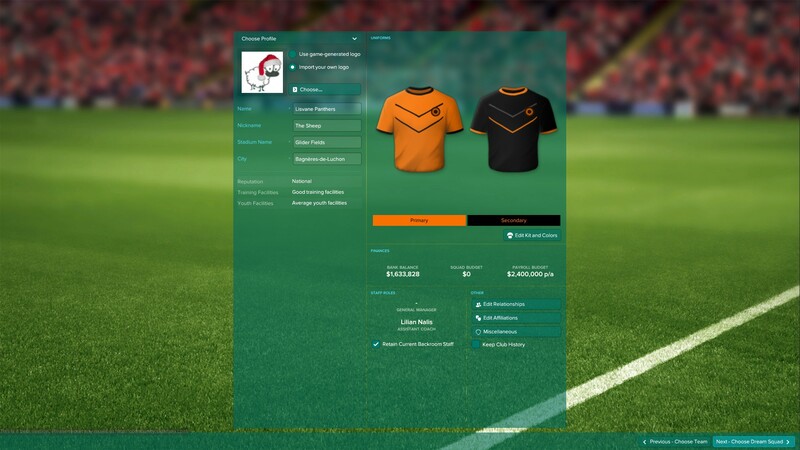 Setting the draft at anything from a shoe string budget in a head-to-head league to a healthy £250 in a league with 10 AI opponents, and the computer will regularly pick balanced squads. My first time around, I splashed the cash on Bale, de Gea and Piqué and was left with minimal funds which I squandered on generally unknown players. The AI on the other hand drafted wisely with one galáctico and players of mid-table Premiership quality. My lop-sided squad was dealt with handily. I’ll be back one day with a better plan, having tried to pick a squad of Cardiff City players showed that my budgetary control in a draft isn’t what it should be. Despite my ineptitude, the inclusion of AI in Fantasy Draft is a good move from SI, making what I thought was a limited feature last year, a must play for quick blasts of fantasy football. Create a Club mode returns, and though I haven’t noticed any fundamental changes to last year, I have witnessed the skill (or cheating) of the AI. Basing my Create a Club on the aforementioned, Cardiff Metropolitan University, I was able to get around the problem of hitting against the limits of the club budget thanks to their amateur status. Any player I created, no matter how high their current or potential ability, came at no cost to the club thanks to their amateur contracts. This was all well and good with the first couple of games of the season leading to easy victories, but soon the vultures were swooping. Tottenham, Man City and Liverpool started poaching my players from their amateur deals with the lure of £60k a week contracts. I don’t know how the AI found my players as I doubt those clubs generally scout the Welsh Premier League, but it was interesting to see the AI at work. Data Analysts lead the new staff roles. Very useful in conjunction with a good scouting team. Some people won’t be convinced by the game this year and will stick with their saves from last year’s edition. 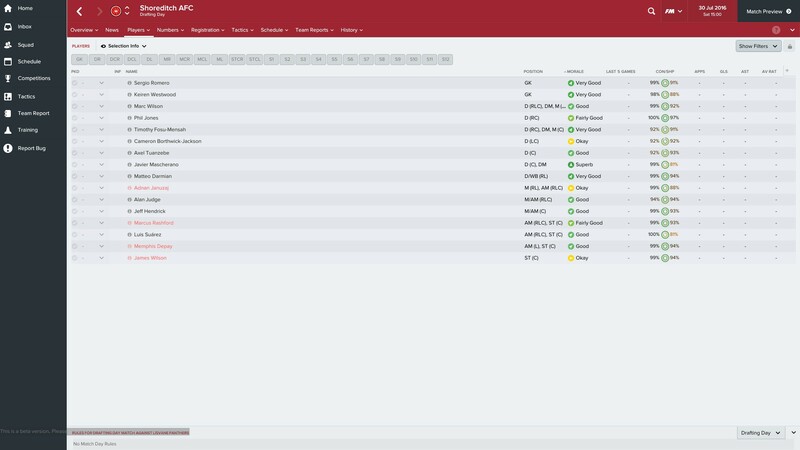 But looking at the game this year, and comparing to my long running 2015 save, I can see the changes to the match engine, contracts and finances and quality of life improvements adding up. It doesn’t hurt that this is the most polished and accurate the match engine has felt for many years. Will picking up 2017 change your life if you’ve been enjoying one of the recent games? No, but you will certainly end up with a more rounded management experience, with the extras like Fantasy Draft now offering you something worth checking out. I haven’t tried Football Manager 2017 Touch yet, but that is certainly being marketed as an entirely different product to the main game. So for the main game, I am recommending you take the plunge and put your faith in SI that this is worth your time and money. Head here for more on our scoring policy. Review based on review code supplied by PR.